Reports of theft cases usually have valuable things, jewellery and money being stolen. But a thief from Bhopal in Madhya Pradesh has left even the police in a tizzy as he steals trivial items. This mysterious man has stolen buckets and mugs, taken bath in someone's terrace, stolen food from the fridge and even chappals! The thief hasn't targetted a single house, but 10 houses so far have been robbed of regular things. The police said they cannot register an FIR for such items. Man Who Robbed Woman at ATM Returns Her Money After Seeing Zero Balance (Watch Video). Rashmi Sadhwani, a local complained to the police that a thief stole bucket and mug from her and the neighbour's bathroom. The thief later took a bath of her terrace and left behind his old clothes. That's not all, he then went into someone's house and managed to steal cooked food material from the fridge. He ate the food on the terrace and left. The thief has also stolen some footwear from houses and left behind his own shoes. Another person from the locality mentioned that their clothes were also stolen. 7 Robbery Attempts Gone Wrong That Give Thieves Everywhere a Bad Name (Watch Videos). All of these antics have been captured on the CCTV footage. The thief has been repeating this on three consecutive days in different houses. 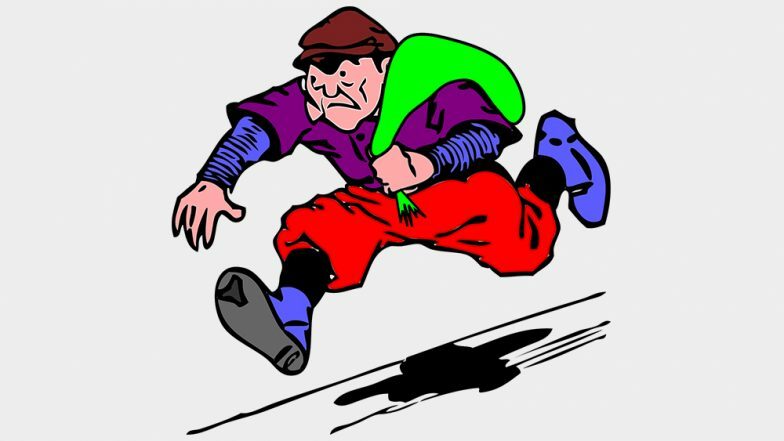 The residents are tired of this thief and have approached the police. But the police say the residents should have taken action themselves when they have his images on their CCTV. Since the items aren't valuable, they cannot register this matter in an FIR. The thief's activities are quite strange and the locals now have to be careful to catch hold of him and hand him over to the authorities.